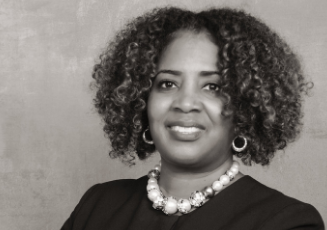 Lisa Cylar Barrett is the Director of Policy at the NAACP Legal Defense & Educational Fund, Inc.
Ms. Cylar Barrett initially joined LDF as Senior Policy Counsel and in that role led the policy efforts related to Economic Justice. Prior to joining LDF, Ms. Cylar Barrett served as the Managing Director, Federal Policy at PolicyLink. In that position she oversaw the development and execution of strategies to advance racial and economic equity on a wide range of issues, including infrastructure investment, housing, education, transportation, access to healthy food, water and economic inclusion. During her tenure at PolicyLink, Ms. Cylar Barrett led many critical federal policy efforts including the successful efforts to include the Promise Neighborhoods cradle to career program, and other equity focused language, in the 2015 reauthorization of the Elementary and Secondary Education Act of 1965 thereby securing a federal program focused on providing critical social and academic supports to children in communities of highly concentrated poverty; defending the Affirmatively Furthering Fair Housing Rule and advancing the implementation of the authorized Healthy Food Financing Initiative. Prior to joining PolicyLink, Ms. Cylar Barrett was a Senior Associate at the Center for the Study of Social Policy (CSSP) where she provided leadership for its efforts with federal agencies and other national organizations to advance and promote policies grounded in equity, which help to strengthen children and families and help them thrive. Before joining CSSP, Ms. Cylar Barrett spent several years in philanthropy working to improve outcomes for children, families and communities in the city of Detroit and the surrounding areas in southeast Michigan. As a Senior Program Officer for the Skillman Foundation, Cylar Barrett developed and managed the Foundation’s efforts related to policy advancement, alignment of investments/leverage from other entities and increased awareness/influence regarding challenges faced by children and families in the city of Detroit. As a Program Officer and Director of Development at the Community Foundation for Southeast Michigan, Ms. Cylar Barrett managed various grantmaking portfolios and oversaw numerous efforts focused on increasing funds available for investment. Prior to her philanthropic career, Ms. Cylar Barrett practiced labor and employment law. Ms. Cylar Barrett received her B.A. from Spelman College and her J.D. from Case Western Reserve University School of Law where she served as an Associate Editor of the Health Matrix Law Journal. Her legal studies also included a semester at Oxford University where she studied International Taxation and Comparative Legal Professions.